if it's a red dot, I'll shoot at the range at the same distance. if it's a variable power scope (e.g. strike eagle 1-6x), it'll get me on paper at 200 yards and then I'll zero it. It's easier to see the differences in a visual graphic. This is the one I use. It also shows why I zero in at 50 yrds. I don't know if its worth quibbling about this in the context of this post, but that would be some very, very fast 5.56 loads. But the actual difference makes no difference to this conversation. For everyday defensive purposes 50 or 100 are both fine. I prefer to not switch between holdovers and unders myself so I zero at 100. I don't know if its worth quibbling about this in the context of this post, but that would be some very, very fast 5.56 loads. kimberkid's results are reasonable in my experience. I have two 16" barrel uppers. With factory Hornady Vmax 55, one produces MV of 2,982 and the other of 2,996 fps. Plugging 2,980 fps MV into JBM ballistics, with 2.5" sight over bore, 6000' Density Alitude, zero at 200 yards -- JBM predicts POI of 1.2" high at 100 yards. IMO POI of 1" to 1.5" high at 100 yards is a reasonable sight setup for many rifles, especially if the gun owner doesn't want to deal with hold overs/unders for reasonably-sized targets out to 250-ish yards. I've sighted in three hunting rifles for my boss this way. So ACOG experts ... two more questions. I should know this but I don't. Is the TA31H made to be zero'd at 100 yards ? Is the lit up reticle suppose to be "lit up" in dim conditions or does it require direct sunlight / daytime light to light up ? Your ACOG has tritum and a fiber optic tube and should glow day and night. Some find the daytime lume to be too bright so they cover the optic tube with electric tape. You can zero an ACOG at any distance you have a cross hair for, including using the 300 meter cross hair at 25 meters. The tritium really only provides enough illumination to see the reticle in complete darkness. If there is much ambient light but it isn't making it to your fiber optic, the reticle won't light up much. An old trick for guys shooting with ACOGs in the dark when they were lighting up their targets with white lights, was to tape a mini cyalume light stick to the fiber optic and then tape over it completely so it didn't give away their position. In daylight, ACOG fiber optics do a great job, often too good as they are so bright that they bloom. As SgtGold mentioned, some guys will partially cover the fiber optic element to reduce this bloom. If I only have a 25yrd range to work with, were should I sight at 25yrds for a 50 or 100 yard zero? Offhand, about 2" low at 25yds would be pretty close to a 50/200 zero. With M4's at 25m, aiming center mass on the zero target (a small silhouette) with bullets impacting the base yields a ~50/200 zero. 100yd Zero- at the 25, POI is 1 1/2 inch low. Question, If I only have a 25yrd range to work with, were should I sight at 25yrds for a 50 or 100 yard zero? Correct, assuming a standard 2.5" sight height over bore. Offhand, about 2" low at 25yds would be pretty close to a 50/200 zero. Incorrect, assuming a standard 2.5" sight height over bore. A 50 yard zero produces a POI 1.1" low at 25 yards. Assuming 2" low POI at 25 yards with the 2.5" sight height, a bullet never zeros. In such a scenario, the bullet's closest arc to the sight line is about 1.7" below line of sight, at around 60 yards. The POI will be about 2" low at 100 yards and about 6" low at 200 yards. For a 50/200 zero (using a 25 yard range), you want point of impact of 1 1/4 inches low. This equates to dead-on at 50. If you get the opportunity at a longer range, confirm your zero. Until then, make sure your group is as tight and close as possible to 1.25 inches low at 25. For iron sights I use a 50 yards zero which keeps me center of mass out to 300. For my Burris ar-332, I zero at 100 yards because that is what the hold over compensation dots are calibrated for. I zero at 50 feet because I plink with mine and with my bad eyesight anything farther looks like an aspirin tablet. 200 300 400 yards I wish would need to put a large scope on it which just doesn't look right imo. I zero'd initially at 50' because front + rear + target just doesn't work that well with my eyes, any more. Now that I've an optic, I'll try it out to 100 yards. If that's successful, maybe I'll even get ambitious and see if there's a 200 or 300 yard range nearby I can try. I have never heard of someone using a 50 foot zero for anything other than a handgun. Even for a 22lr rifle, 75 feet is a close zero. 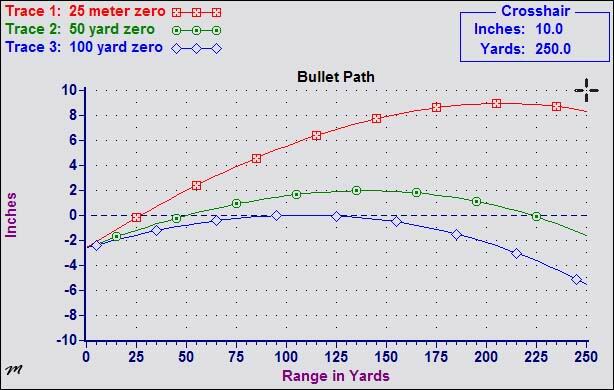 Running a couple sample 223 loads through JBM, a 50 foot initial zero produces a second zero of roughly 450 to 500 yards. "Plinking" at 50 feet with an AR-15 due to vision issues suggests that you (1) need some vision correction and (2) need some level of magnification.